Advertising and branding guru, Lakshmipathy Bhat, shares his two cents on festive marketing by brands on social media. Greeting friends and relatives on special occasions like birthdays, anniversaries and festivals, is an expected social behaviour. Of late, such greetings are done through messaging platforms or through social media. So the personal touch of a phone call or a hand written note or a card has anyway disappeared. The greetings are ‘templatised’, mechanical and mostly treated as a chore or formality. Over the past few years, there is competition to your friends & relatives in the ‘festive occasion greeting’ game – your brand. They take to social media to wish everyone during special occasions and festivals. So be it Independence Day, Eid, Christmas, Diwali or Earth Day – everything is an occasion to create a social media post. Twitter and Facebook are flooded with tweets from all kinds of brands – shampoo, beer, telecom, furniture…all tripping over each other to wish their customers. Here’s the thing they all forget: consumers don’t give a damn if their favourite brand doesn’t wish them ‘Happy Independence Day’ on Aug 15th or misses out on a Diwali or Eid greeting. It is the greedy brand managers and their social media agencies who see every occasion as an opportunity to add to the white noise on the internet. The motive – fear of missing out, being scared that your competing brand will put out a Diwali greeting tweet drives the brand manager to push his agency to do so. Agencies see it another check box ticked off justifying their monthly retainer or simply feel that they have accomplished ‘something’ for the brand. In my view, if a brand is compelled to put out a social media message during such occasions, a simple ‘best wishes’ will do. However, that is likely to be a boring message with no ‘engagement’. So the urge to add another layer to it – one of integration with a brand message. So a cement brand is likely to wish for a strong nation (get it?) on the occasion of Independence Day or ‘strong relationships’ on Mother’s Day or Father’s Day – the possibilities are endless. The trouble is that such links to the brand get tenuous more often than not. Brands are also known to take a stand on social & political issues of late. There are pros and cons to that approach – a topic for another blog post perhaps. However, it is best for brands to avoid weaving in ‘social issues’ into their festive greeting posts. There are very few topics in this world which are agreed upon by 100% of the intended audience. Most of the topics will have a contrarian view (as opposed to the one taken by the brand) and likely to turn into a PR disaster. Recently, we saw a slew of brands being challenged for their views on bursting of fire crackers during Diwali and some of them had to delete such tweets (including some from 2014!). In this context it also helps if the brands keep the imagery positive during festivals avoid coming across as alarmist or negative. ‘People don’t want to have conversations with a beer brand‘, said the incomparable @rameshsrivats. Marketers should stop trying to force-fit social media into their brand and start figuring out how best their brand fits into the social media activities of their consumer. 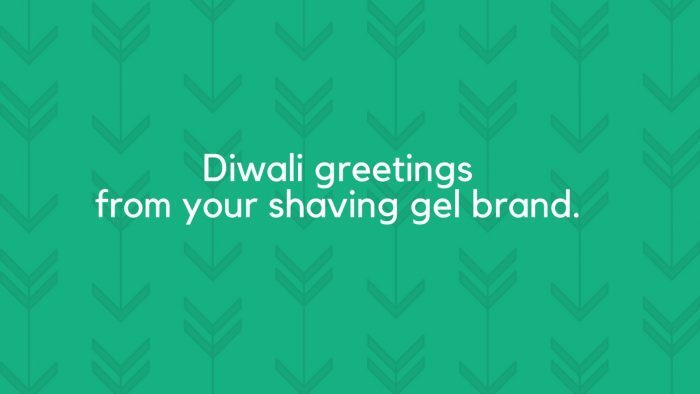 In my view, the average consumer is not going to feel terrible if he does not see an ‘Eid Mubarak’ or ‘Happy Diwali’ tweet from his brand of shaving gel.